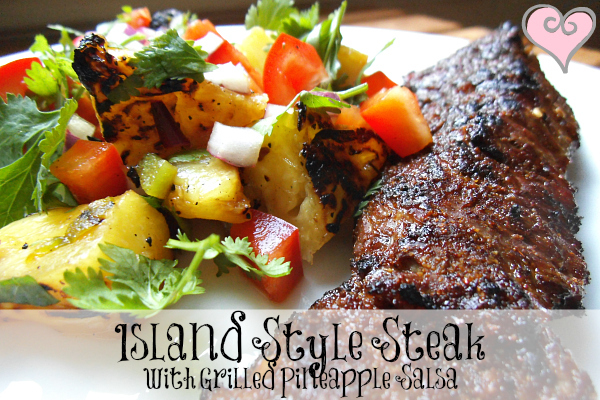 A spicy island style rub for the beef is cooled down with a refreshing, flavorful and all around delicious grilled pineapple salsa. 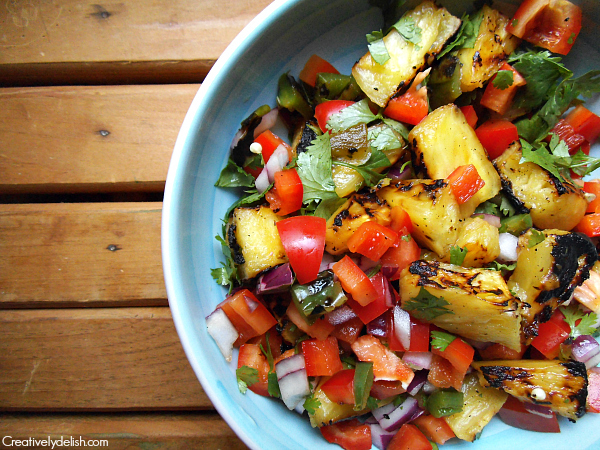 There are so many reasons to use pineapple in your cooking this summer! Not only does it offer excellent health benefits - it's also in season and perfect for grilling. 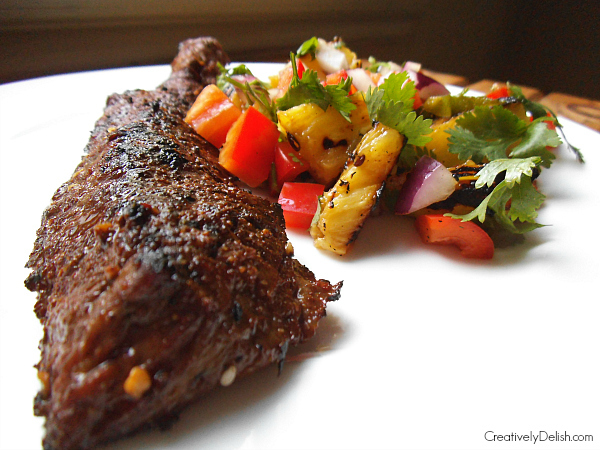 Even just using the juice in a marinade is great because the enzymes tenderize the meat so well. I've wanted to make a grilled pineapple dish for quite a while now, and I had the perfect opportunity when I saw they were on sale this week. The dish came out so perfectly seasoned and the leftover salsa will be great in salads. I served this just as it is, but it could also be easily made in to a taco dinner. 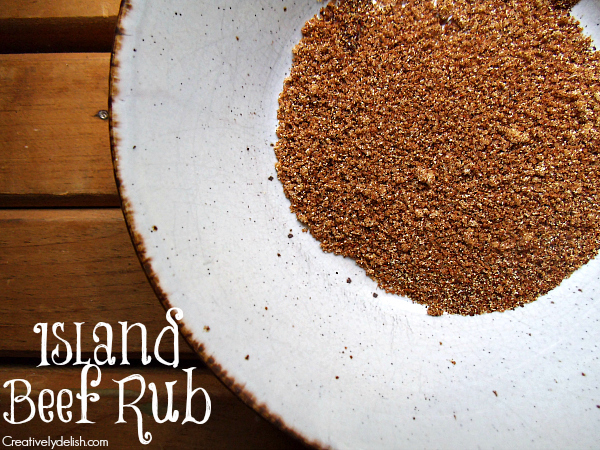 The island beef rub has only four ingredients, with zero salt! Salt is the enemy for me in the summertime since you need to squeeze in to a bikini at a moments notice, so I try to use it sparingly when I can, and this rub was perfect without it. 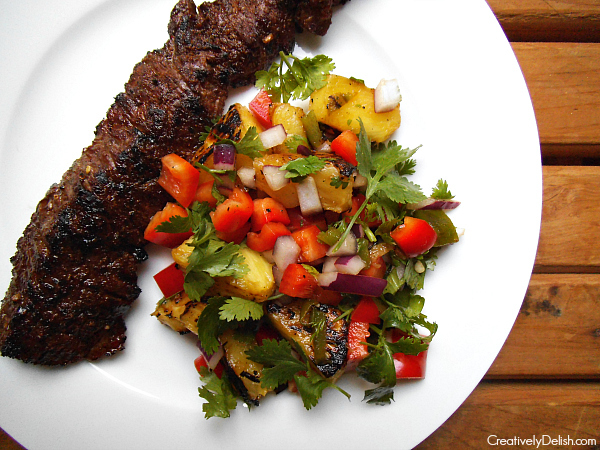 The grilled pineapple salsa was a great addition to the dish, since the beef on its own would be way too spicy. Although the salsa has a grilled jalapeno in it, it never gave off any hints of real hot spice, just a nice kick and some added flavor. 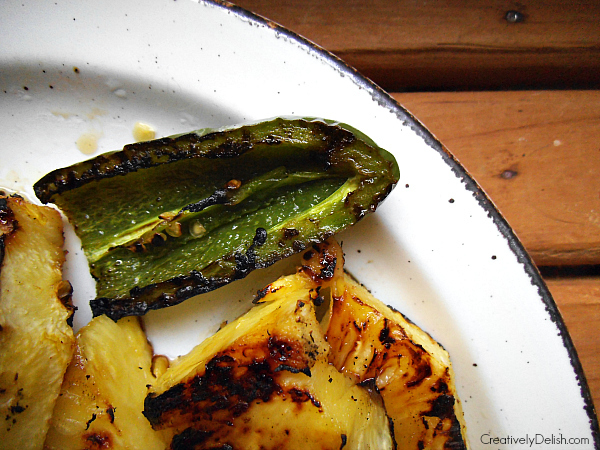 You'll know when the pineapple and jalapeno are done when they get some of those nice char marks on them. Let them cool before slicing the pineapple and chopping the jalapeno. After I was done with the salsa, I ended up with three extra rings of grilled pineapple left, so I stored them in the fridge and made chicken sandwiches with them for lunch the next day. It was a great way to put some flavor in the sandwich without any artificial condiments to get in my way! I seeded and diced the jalapeno to tone down the heat, but you can omit it altogether if you so please. 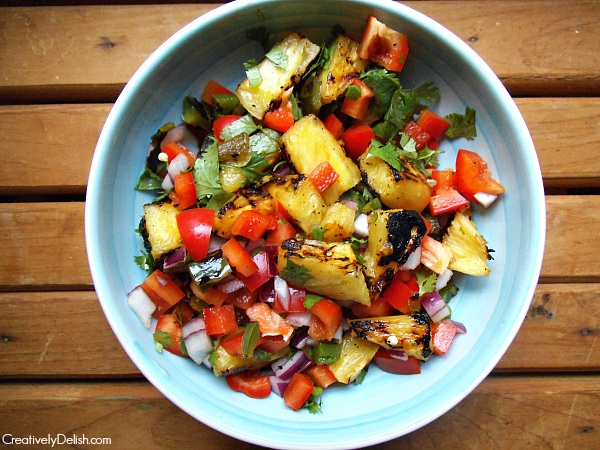 With a simple splash of lime juice and a toss of fresh cilantro, this grilled pineapple salsa became my new favorite obsession. I made the salsa while the beef was on the grill - make sure to grill the pineapple and jalapeno first so it gives you time. It's important to let the beef rest on the cutting board for five minutes after grilling so it can lock in all those yummy juices and helps to not let the beef dry out if you have leftovers. We chose to use a lean cut of sirloin, however a skirt or flank cut will also be just as tender. Tip: For leftovers, make a green salad with spinach or romaine, then slice beef and spoon salsa over the salad - voila! A delicious lunch without any fattening, sugar-loaded dressing! In a small bowl, combine chili powder, garlic, cumin and sugar then rub the mixture on to the beef on both sides. Let it sit for 20 minutes in the fridge then 10 minutes on the counter before cooking to lock in the flavor. 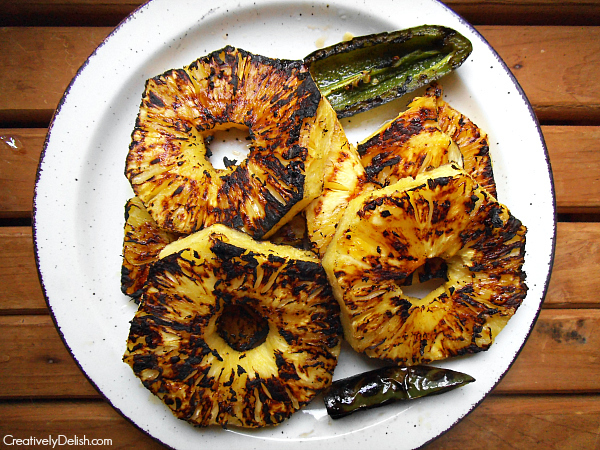 Heat a grill or grill pan and grill pineapple and jalapeno on both sides until charred. Remove and transfer to a cutting board. Grill meat on both sides until cooked to your liking, making sure you see a few char marks on each side. To prepare the salsa, cut up the pineapple into smaller pieces, chop the jalapeno and transfer in to a bowl. Add the remaining ingredients and let it sit for 10 minutes before serving. These can be served with just the beef and salsa but would also be fabulous served taco style.